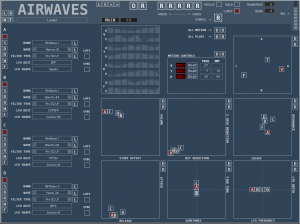 AirWaves is a unique Synthesizer which uses 24 XY Motion Sequencers to build collages using Shortwave Radio signals as its Sound Source. Shortwave Radio is an Alien World that has fascinated me since childhood and I’ve been wanting to explore making an instrument such as this for a long time. The Motion Sequencers ensure that you will always get something new using the many Randomizers, and presets can have an organically complex lifespan. Each Sequencer can be recorded manually by pressing Record, playing a note and moving the corresponding XY controller. Once the sequence is recorded it will be played back immediately. Alternatively there is a large database of prerecorded Sequences included which are used by the Randomizers.